Shoot-Out 2009 | NOVA Cool Cats Special Hockey, Inc.
Special Hockey Players stand in their official team jerseys after the 2008-2009 shootout exhibition. (note, not everyone is shown. Different photos show different participants). Exhibition Restults: Eleven different shooters skated in front of a sold-out Verizon Center crowd during the first intermission of the Atlanta Thrashers vs. Washintgon Capitals game on Thursday, February 26, 2009 in the Washington Capitals Shootout Exhibition, sponsored by the Washington Times. Goaltenders Ted, from the Northern Virginia Cool Cats, and Zach, from the Montgomery Cheetahs, defended well, stopping most of the shots they faced. Some shots resulted in goals for each group, giving plenty of reason for the participants and fans, to cheer. Photos of the action show the fun. The Capitals also pulled off a win, making game viewing a fun event for fans for the balance of the night. In conversation, Ted lets referee Jarrod Wronski know he’s ready, while at the opposite end, Zach makes a save on Andrew shot. Jimmy is shown on the Jumbotron. Washington Ice Dogs players ready to shoot. Jimmy shoots on Ted David shot is saved by Ted. Fan favorite Alexi, of the Cool Cats, skates in on Montgomery Cheetah’s goaltender, Zach, shoots, and scores! See the reaction of the fan picked out of the crowd behind the glass. NOVA Cool Cats’ Scott, in his third Washington Capitals’ Special Hockey Shootout exhibition, takes the final shot of the exhibition against Montgomery Cheetah’s Zach, who makes the body save just off his blocker glove. 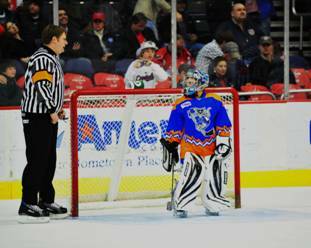 Preview: Members from the Special Hockey community, including the Washington Ice Dogs, NOVA Cool Cats, Montgomery Cheetahs, and Baltimore Saints will be participating in an exhibition shootout competition to showcase the skills of the Special Hockey players. The Special Hockey program is a worldwide effort to provide hockey opportunities to athletes with various challenges, including autism and Downs Syndrome. Last year, several players scored goals during the event. The exhibition will be held during the first intermission of the Atlanta Thrashers vs. Washington Capitals game, Thursday, 2/26/09.